Mid-October is one of the best times to road trip around Wisconsin. The fall colors get amazing, especially on the crisp sunny days we frequently have this time of year. Pumpkins dot many farms, trees burst with a variety of colors, and towns celebrate with harvest festivals. So many “State Trunk Tour” rides are fantastic right now. 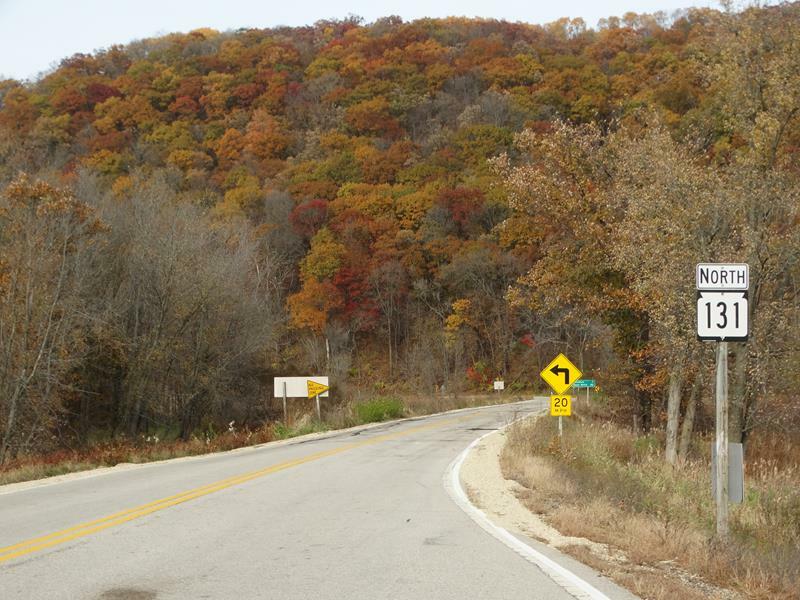 But we have go to give Highway 131 a shout-out in particular for its navigation of the beautiful Driftless Area, its frequent interaction with the Kickapoo River (it crosses it 11 times!) and the lovely little towns it traverses. Running about 80 miles from Highway 60 along the Wisconsin River up to Tomah, Highway 131 runs through the heart of Wisconsin’s incredible Driftless Area, a section of the Midwest that glaciers biffed on flattening thousands of years ago. Consequently, this area has few natural lakes; tons of beautiful rivers, streams, bluffs, and valleys make this relatively rugged terrain excellent for exploring, recreating, or just going for a drive to admire. 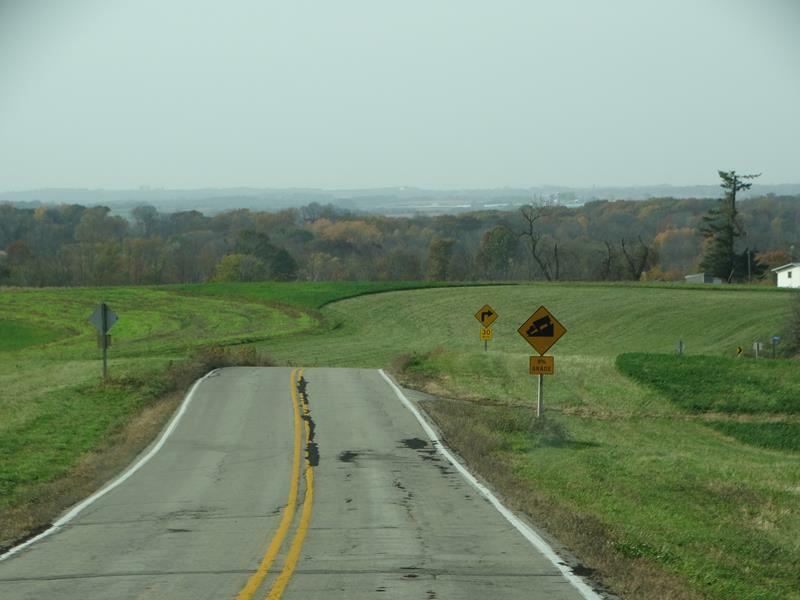 Highway 131 primarily runs through Crawford and Vernon Counties, with a corner catch of Richland and ending in Monroe County – all in the Driftless. 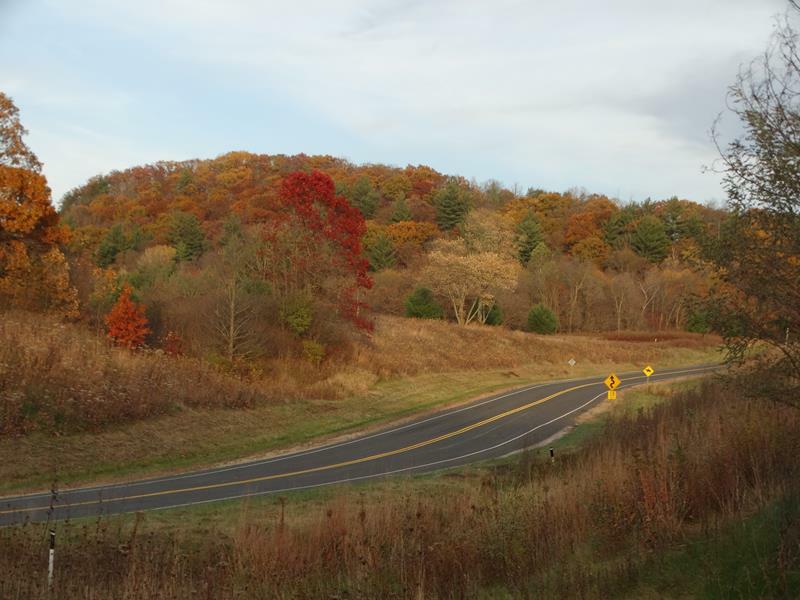 High points along Highway 131 can offer expansive views of the Driftless topography. 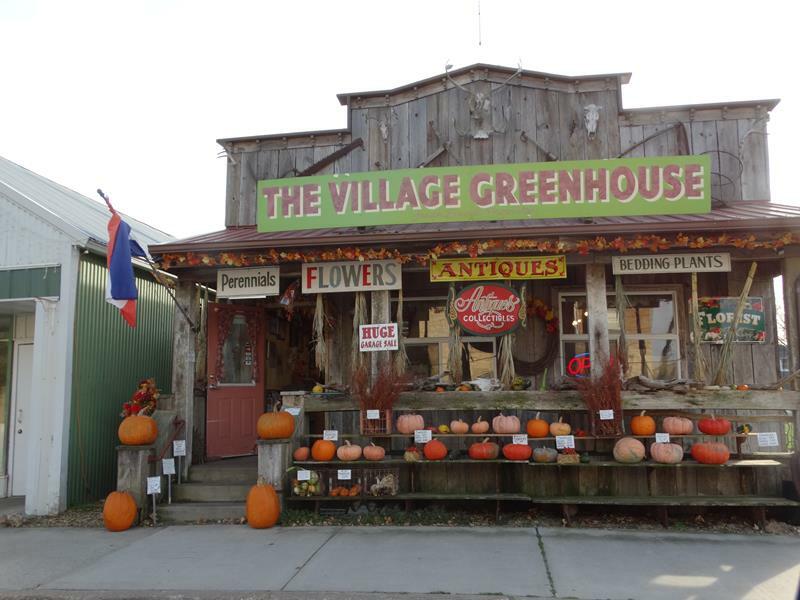 Charming shops offer unique items and antiques, like this one in Gays Mills where Highways 131 & 171 meet. We noted Highway 131 crosses the Kickapoo River 11 – 11 – times on its journey. The Kickapoo is sometimes referred to as the “Crookedest River in the World,” and it certainly has its twists and turns. 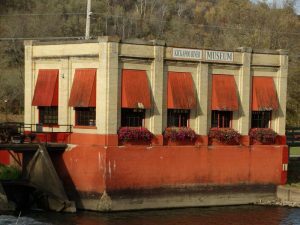 Learn about some of them at the Kickapoo River Museum, which isn’t always open in October but it’s worth a try. 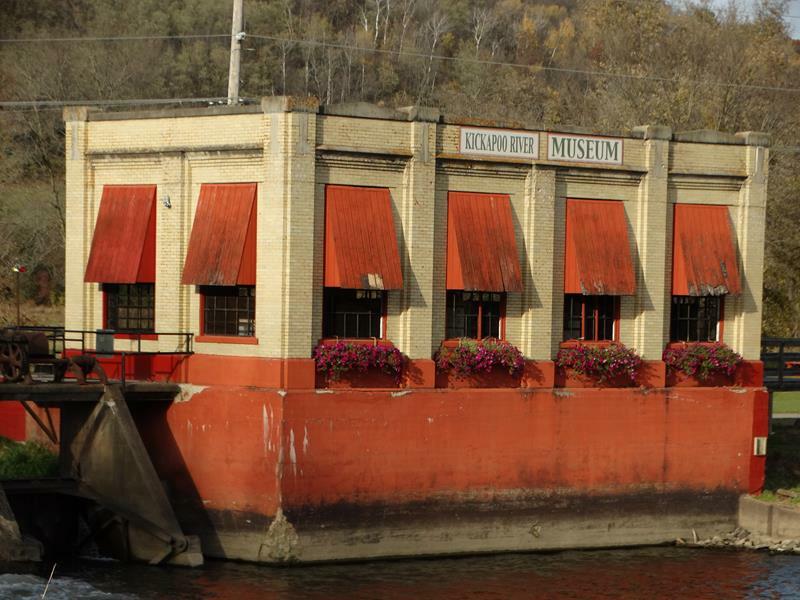 The museum is located in Gays Mills at a dam on the river at Robb Park. For kayakers and canoers, an easy portage is available. There’s also the Kickapoo Valley Reserve, which examines the area, its changing river, its tendency to flood, and more. The Kickapoo Valley Reserve Visitor Center is along Highway 131 a mile and a half north of La Farge. This 8,300 square foot facility – heated with geothermal and solar – offers beautiful views, educational galleries and interactive displays designed to show you more about this unique area of Wisconsin – and the country, really. 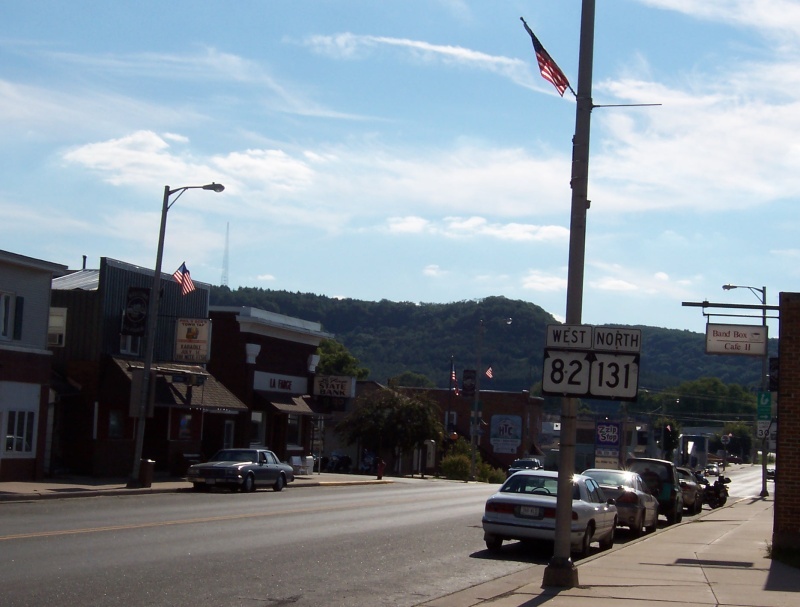 HIghway 131 connects with 82 – another beautiful Driftless drive – through the community of La Farge. 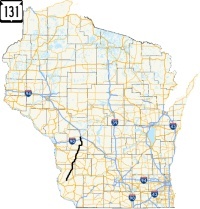 The towns Highway 131 goes through include Steuben and Gays Mills, which is Wisconsin’s “Apple Capital” and hosts a few of the aformentioned sites. There’s also Soldiers Grove, dubbed “America’s First Solar Village.” In 1979, the town was recovering from a massive flood – the Kickapoo isn’t always kind – and during reconstruction became the first incorporated town to require new buildings to obtain at last 50% of their energy from the sun. You can see it in the newer buildings. The original downtown location for Soldiers Grove is now a park – and it still floods on occasion. Viola, where Highways 56 and 131 meet, has seen its share of flooding too. Some markers along the road cutting through parks downtown show just how high water has reached – and it will be higher than your vehicle! Some classic buildings downtown include stamped signs that show their original purpose, including a former opera house. 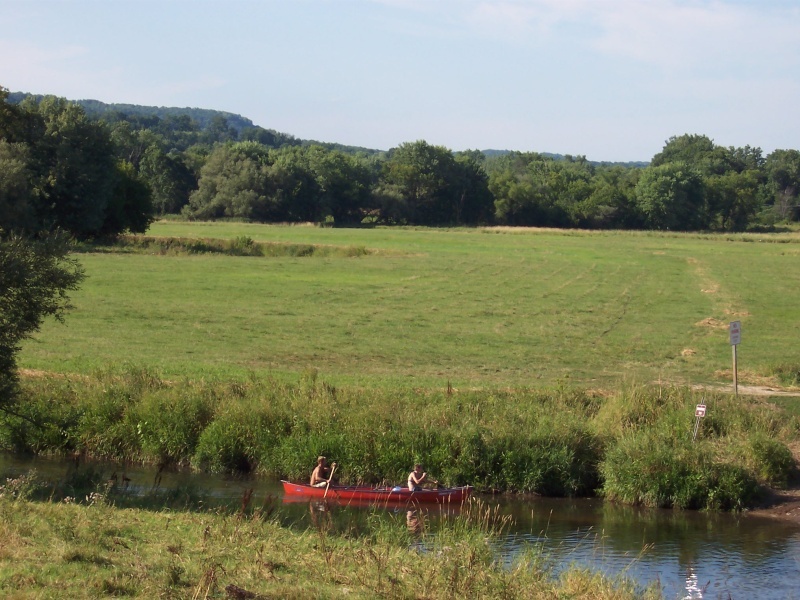 La Farge hosts the Kickapoo Valley Reserve, an 8,500+-acre tract of land along the Kickapoo River leading towards Ontario. In the Reserve, you can explore sandstone outcroppings and a variety of native plants and animals in their habitat. Canoeing along the Kickapoo near Ontario. Nearing Highway 33, Ontario is a popular town for renting canoes or kayaks to ply the waters of the Kickapoo. They also offer an interesting “historical walk” that features original structures and takes you past some ancient burial sites. Past Ontario, Highway 131 winds up to Wilton, a stop about midway along the famous Elroy-Sparta Trail. This lovely town has some cool murals, downtown shops, and a few B&B’s popular with trail riders. This area is also Amish country, so watch for slow-moving, horse-drawn vehicles along your path. 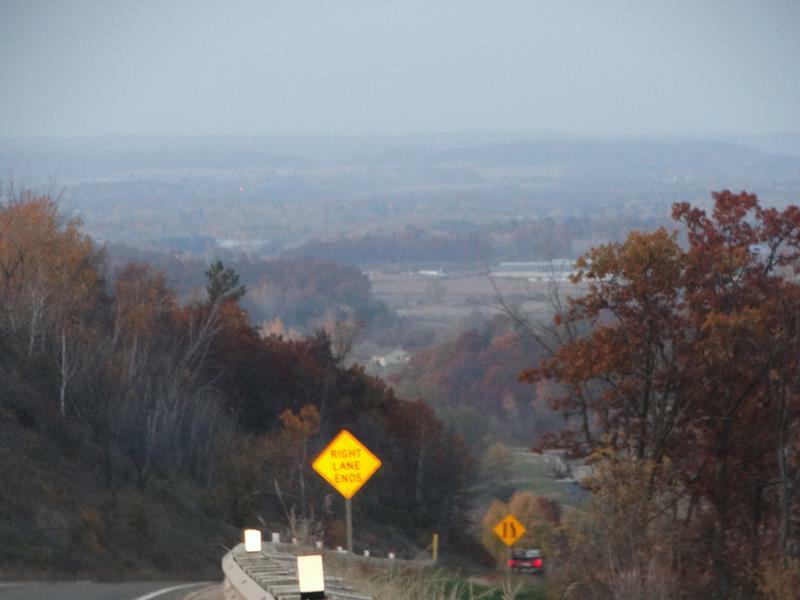 A vast expanse of Wisconsin’s “Cranberry Country” comes into view as Highway 131 begins its descent into Tomah. Like The Who says, you can for miles, and miles, and miles.. Since the Kickapoo River rises in Wilton, Highway 131 becomes Kickapoo-free for its next leg. After briefly joining Highway 71, Highway 131 reaches a crest that overlooks its final destination: Tomah. This major crossroads city is where railroads, early highways, and eventually Interstates meet up. It’s no surprise that Tomah is a big destination for everything from hotels to logistical companies; with all this transportation, it’s also no surprise that Gasoline Alley comic strip creator Frank King grew up in Tomah. Highway 131 crosses I-90 and then ends near downtown at U.S. 12 and Highway 16. That’s 80 miles down, and plenty of cool stuff to see and experience. 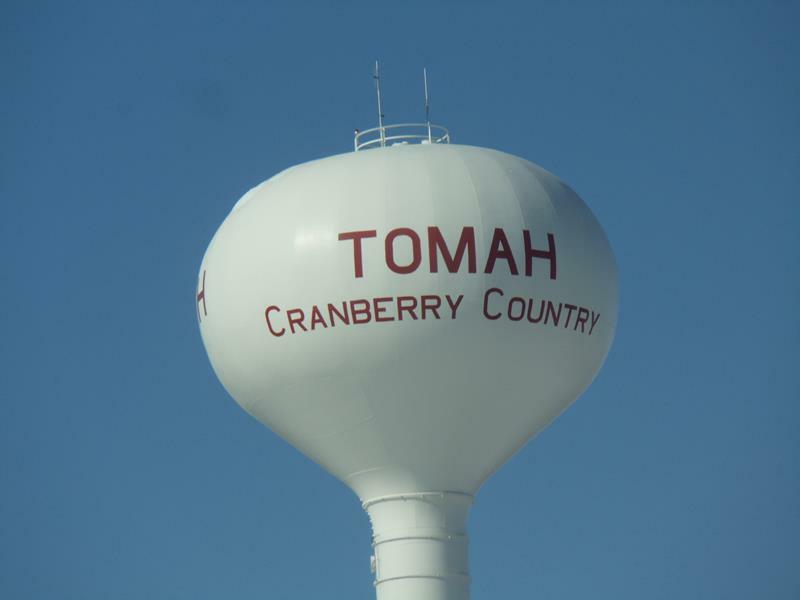 From Tomah, you can connect to nearby Warrens, which also holds the Wisconsin Cranberry Discovery Center. Warrens can be reached by connecting to Highway 21 via U.S. 12, straight north past the spot where Highway 131 ends. Basically, from Tomah you can connect to wherever you want to go pretty easily! And there you go: a great drive on Highway 131. It’s an easy ride for an afternoon – or make it a recreation-filled multi-day trip. It’s all up to you. Kickapoo River Museum, Gays Mills. Located in a former dam house on the Kickapoo, this historic structure holds displays on the various geographical and ecological aspects of the entire river valley. Robb Park, 608-735-4341. Log Cabin Heritage Park, Gays Mills. Historic log cabins and other structures together on the site of a former sawmill. Open year ’round. 212 State Highway 131, 608-735-4341. Kickapoo Valley Reserve Visitors Center, La Farge. This recent creation anchors the Kickapoo Valley Reserve, uses geothermal and solar energy, and features exhibits a’plenty about the area. Those include an attempt in the 1970s to construct a massive dam that was halted; it would have altered the valley immensely. Wildcat Mountain State Park, Ontario. Sandstone bluffs provide excellent views across this 3,600-acre state park, which is open for year-round recreation including hiking, canoeing, fishing, and cross-country skiing. 20 miles of trails and gorgeous vistas await, and you can rent canoes and kayaks in the park and in nearby Ontario. Drifty’s Canoe Rental, Ontario. How crooked is the Kickapoo? It runs 130 river miles but only about 60 miles as the crow flies. That’s a lot of twists and turns – perfect for canoeing, kayaking, or just floating on a tube. Drifty’s can outfit you with equipment rentals, shuttles, pick-up service, and more. (608) 337-4288. Elroy-Sparta Trail, Wilton. The first rail-to-trail conversion in the United States, the Elroy-Sparta Trail connects its namesake communities with a 32-mile bike and recreational trail that features three hand-bored tunnels, all built around 1870. Highway 131 intersects the trail in Wilton, a charming town between tunnels #1 and #2 that offers eateries, B&Bs, camping parks, and shops. 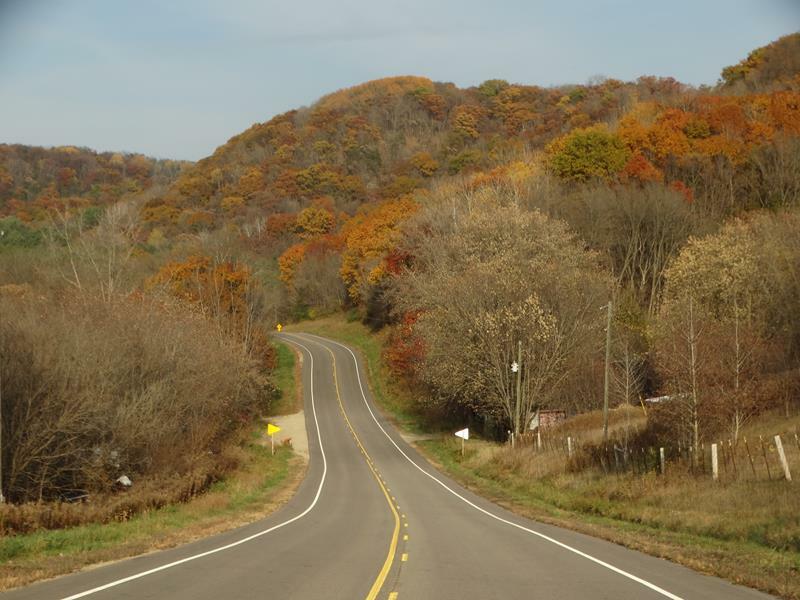 See more State Trunk Tour routes here, and enjoy how gorgeous and fun the roads in Wisconsin can be to explore!